The name should speak for itself, and players should take this very seriously because the “risk of ruin” is essentially the chance for players to go bust beyond recovery. Anyone can have a losing blackjack session, but if the amounts wagered on any given day represent only a fraction of his bankroll, this won’t turn into a critical blow. The bankroll shouldn’t be confused with the amount of money that the player takes to the casino or buys in when playing online. A savvy player who tries to make blackjack more than a relaxing pastime, will have a bankroll that is at least 10 times higher the amount he buys-in on a session. 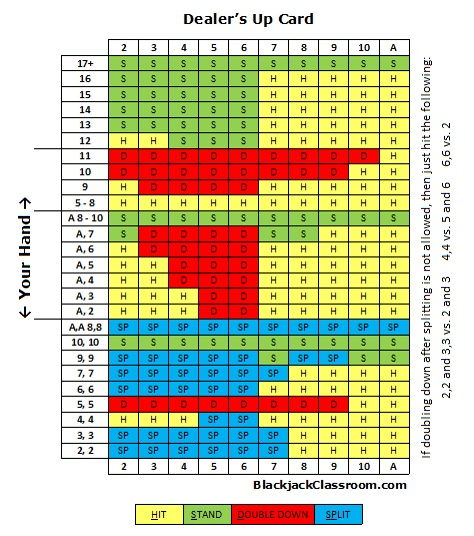 Furthermore, the amounts wagered on each hand should only represent a fraction of the buy-in, so that the chosen blackjack strategy can be employed successfully. The risk of ruin is enhanced for card counters, because these players need to dramatically increase their bets when many high cards are left at the bottom of the remaining decks. Without sufficient money in their bankrolls, a single unlucky session could bring them to their knees. While blackjack is a game that is played between the player and the dealer, the situation changes slightly in blackjack tournaments where the competition is amplified. The short-term objective is the same as players need to come closer to 21 without busting and hands are won or lost depending on how the dealer performs. On the long run though, players need to outshine the competition and win more money than the other ones who bought in at the blackjack tournaments. Basic strategy is no longer enough in this case and the risk management demands outstanding control and understanding of the size of your wagers. Players need to stay flexible and decrease the wagers when they are ahead while betting slightly more when they need to close the gap separating them from their opponents. In an attempt of getting ahead, many players commit the mistake of betting unreasonably high amounts and the only thing they achieve is to go broke quickly. Players should aim to be in the top percentage at their table, so the right thing to do is to wager slightly more than the opponents from the very beginning. Find out what blackjack strategies work better on the long run, and how to manage risks both at cash games and blackjack tournaments.